Yesterday, I tried a yoga class with my friend Karen @YMCA in Durham. It was actually a yoga class that I didn't actively dislike. I could do almost all the moves and it made my back feel really great by the end and when I woke up this morning, I had no residual soreness in my lower back. I probably should do more yoga to help out my back but I find it hard to commit to yoga. It doesn't feel like I'm doing much but one hour of yoga seems like 3 hours. It would probably be easier if I could just come up with a routine I could at home and this class helped me see which moves I could do at home (sun salutation, downward dog, plank, warrior poses, child's pose, cobra, and one legged stands). It seemed like this should have gone faster but those hand release push-ups were painfully slow. 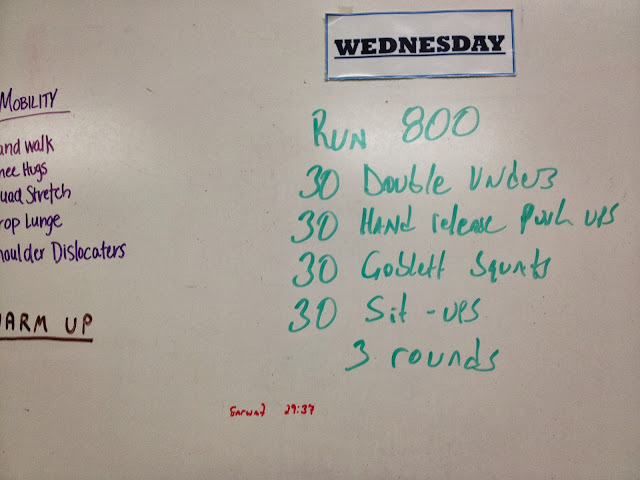 This seemed like an endurance workout, yesterday the 5-6 minute WOD had me more gassed than today!